Greetings from Land O’Lakes, FL! the Lightning (Stanley Cup Champions 2004) and the spring training home of the Yankees. and University of Tampa (my DH’s alma mater). According to Dr. Beach, the Tampa Bay has some of the best beaches, including Fort Desoto, Honeymoon Island, Caladesi Island. Although Tampa may lack the metropolitan and ethnic flare typically found in larger cosmopolitan cities, our beautiful city still offers its own flavor of culture. 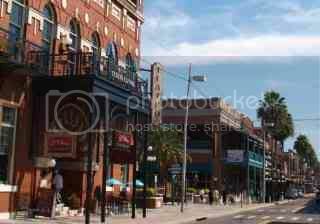 Ybor City, a section of Tampa settled by Cuban immigrants in the late 1800s, produced more cigars than Havana and became known as the Cigar Capital of the World. Today, Ybor City is our own little Spanish New Orleans and serves up some of the best Cuban food outside of Miami. In late October, Ybor City celebrates Guavaween, which can be compared a Halloween Mardi Gras. Fifteen years ago, I met my husband one cold drunken Guavaween night. Tampa residents love to spin pirate tales about a mythological pirate, José Gaspar, who invaded our streets during the late 1800s. From late January to early March, we celebrate Gasparilla with a variety of pirate parades, festivals and races. As for tourist spots, I highly recommend the Florida Aquarium, which offers a gorgeous glimpse of our wetlands and coral reef and a fun splash area for the kids. Busch Gardens is another favorite tourist hot spot. The roller-coasters and up-close animal exhibits are simply breathtaking in more ways than one. Lowry Park Zoo is another great place to visit when the natives are restless. If you visit Tampa in the winter months, you will want to stop by the Teco Manatee Viewing Center. During the cooler months, manatees seek refuge in the warm waters discharged from the power plant. On a good, cool day, you can view close to a hundred manatees free of charge. …and several rivers to canoe such as Hillsborough River, Weedon Island or Weeki Wachee Springs, which is the home of our world famous mermaids. Rumor has it even Elvis stopped there. If hiking trails and primitive camping is your pleasure, Jay B. Starkey Wilderness Park was featured last spring in the St. Pete Times as one of the best camping spots in Florida, but I prefer the “luxury amenities” at Hillsborough River State Park. I love living in Tampa Bay and can’t imagine living anywhere else. I enjoy spending almost every day outdoors and wearing flip flops all year round. I’ve even got the tan lines to prove it. This entry was posted in travel, Wordful Wednesday and tagged beach, BlogTrotting, Busch Gardens, canoe, Gasparilla, hike, Lowry Park Zoo, miscellaneous, random, Run DMT, Tampa, trails, travel, USF, UT, Wordful Wednesday, Ybor City. The architectural firm I used to work for designed renovations and additions at the Gasparilla Inn and I read about it all the time but I never realized the name came from a famous pirate. Learn something new every day. We are trying to plan a family vacation this summer, we want somewhere beachy but with lots of fun, family stuff to do. Tampa sounds fantastic! 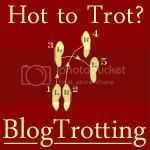 Thanks for being a part of BlogTrotting! Looks like a wonderful & beautiful place to live and visit. It is so nice to see your little corner of Florida through your eyes. The closest I ever got to visiting Florida was the Okeefenokee about 18 years ago when we were living in Atlanta. *squee* Manatees! I love them and I would love to see them in the wild. The zoo pictures are great and the shot of the University of Tampa looks lovely. Interesting history about Gasparilla, I think I’ll use some of that for my next 7th Sea character. I love your family photos! that one with the Tampa sign is awesome! your girls are such cuties! Ohhhhhh how I want to visit!!! You should work for tourism in your area!! WOW! I had NO idea Tampa Bay had SO much to offer. Fascinating! Tampa is also the home of some guys who golf on Sunday afternoon and find it amusing to moon tourist buses! A couple years ago we were down there in Tampa ready to embark on a cruise and yes we were the ones mooned! I’d love to come back and visit some of the places you showed off. Oh wow…feel like I’ve been there! Looks nice and warm! Jealous. Left an award for you at my blog today. Come on by and pick it up. You have such a very beautiful family! I love this picture filled with all of these happy family memories. So sweet. Tampa looks like a great place. I’ve been there once but I was there for a one day training and had to catch a flight to Pensacola immediately after the training. I missed my flight and had to take a long cab ride to Pensacola for my training there the next day. I’ll have to go again and spend more time. So cool! Thanks for the tour of Tampa. I have never been to Florida, but I sure would love to visit… especially during our winters! JEALOUS! I love Florida and actually planning a month long trip there this August. We have only been to Tampa once and that was just at the airport because we were staying at Indian Shores. I will have to visit Tampa one day, looks fabulous. This trip we are going to Crystal River, Daytona, Orlando and Hollywood Beach. Yes I love Florida…..I live in the wrong place. Hoping to change that soon Well not soon enough! Thanks for stopping by! The shots are awesome! I would come visit. I love the tour of Tampa! What a great idea for a post. I haven’t been to Tampa since I was ten years old so I don’t remember it (except my aunt had BIG dogs). 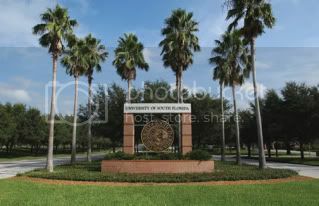 My husband went to college in St Pete (Eckerd), and hopes to move me there one day! Excellent post — I’d love to have year round sun! I love Tampa! My family had a great time there earlier this year and we want to go back. We love the aquarium and Busch Gardens, and we want to see the science museum and ride the trolley downtown. Before kids, my husband and I visited several nature parks in the area.